The effectiveness of transmitting force by using undulation is well known, but it takes time for the whip to flex and then sequentially transmit force. An example of using undulation is a whip whose tip movement exceeds the speed of sound. The whip-like motion principle requires that the user firmly plant the feet on the ground – a position that may lead to physical damage. Experts note that the load on different parts of the body is lowered by using the entire body appropriately. Using the term “nanba” symbolically to indicate body movement that does not use twisting, undulation, or the firm planting of the feet and that exerts minimal load on the joints, we investigatemovement of a bipedal robot based on state transitions that utilize instability. Speed and robustness result when a state (posture) is created instantaneously so that no blockage by the body occurs and transitions from state to state are made in a single step. Y. Kawazoe, “NANBA Walking Robot (JIZAI Movement of Physical Body Using State Transition with Instability),” J. Robot. Mechatron., Vol.26, No.6, pp. 673-684, 2014. T. Yamamoto, “Project for the Practical Application of Next-Generation Robots: Project for Supporting the Development of Prototypes,” J. of the Robotics Society of Japan, Vol.24, No.2, pp. 169-170, 2006 (in Japanese). R. A. Brooks, “A robust layered control system for a mobile robot,” IEEE J. of Robotics and Automation, Vol.2, No.1, pp. 14-23, 1986. R. A. Brooks, “Intelligence without representation,” Artificial Intelligence, Vol.47, pp. 139-159, 1991. T. Gomi, “Impact of Non-Cartesianism on Software Engineering,” AAI Books, Ontario, Canada, pp. 487-519, 1998. Y. Kawazoe, “Emergence of the Human’s Dexterity and the Intelligence of Autonomous Robot as a Complex System,” JSME annual meeting 2002, No.6, pp. 171-172, 2002 (in Japanese). 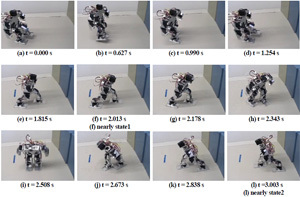 Y. Kawazoe, T. Nagumo, S. Inou, and K. Suzuki, “Emergence of Adaptive Dynamic Walking NANBA of Humanoid Biped Robot GENBE Based on the Distributed Control of Physical Body in a Martial Art,” Proc. 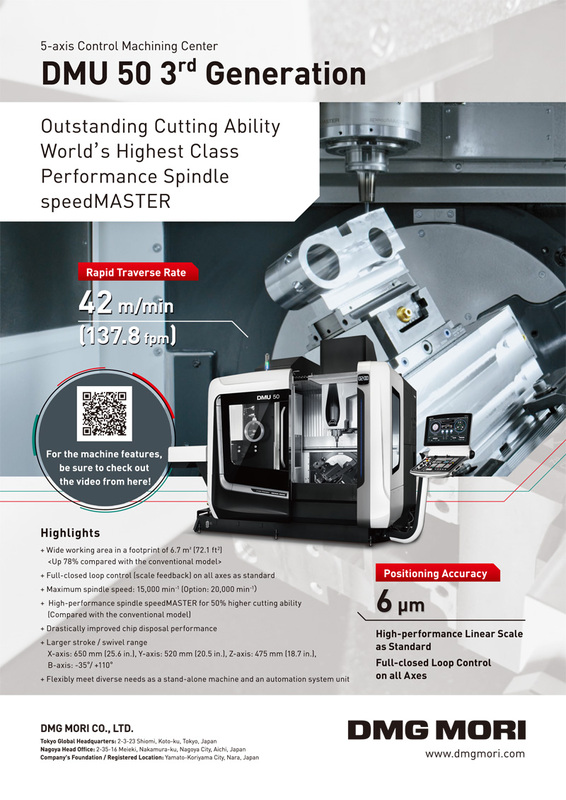 of the 9th Symposium on Motion and Vibration Control, pp. 514-519, 2005 (in Japanese). T. Sugihara and Y. Nakamura, “Whole-body Cooperative Reaction Force Manipulation on Legged Robots with COG Jacobian involving Implicit Representation of Unactuated Coordinates,” J. of Robotics Society of Japan, Vol.24, No.2, pp. 222-231, 2006. Y. Kawazoe, T. Sunaga, and T. Momoi, “Emergence of Instantaneous NANBA TURN of Humanoid Biped Robot GENBE Based on the Distributed Control of Physical Body in a Martial Art with Anti-ZMP,” Dynamics & Design Conf. 2006 (CD-ROM), pp. 560-1-560-6, 2006 (in Japanese). Y. Kawazoe, K. Harada, and Y. Shimizu, “Autonomous Shock Avoidance during Falling Down and Instantaneous Rising of Biped Robot GENBE with Anti-ZMP,” Dynamics & Design Conf. 2006 (CD-ROM), pp. 550-1-550-6, 2006 (in Japanese). Y. Kawazoe, “Emergence of JIZAI Movement of Humanoid Biped Robot GENBE Based on the Distributed Control of Physical Body in a Martial Art Utilizing Instability,” Symposium on sports engineering: symposium on human dynamics 2006, pp. 296-301, 2006 (in Japanese). Y. Kawazoe, S. Moriyama, and J. Taguchi, “Emergence of JIZAI Movement of Humanoid Biped Robot Based on the Distributed Control of Physical Body in a Martial Art: Going Up and Down the Stairs with Instability,” JSME annual meeting 2007, No.7, pp. 27-28, 2007 (in Japanese). Y. Kawazoe, J. Taguchi, and J. Kebukawa, “Development of NANBA Run of Humanoid Biped Robot GENBE with Small-Soles Based on the Distributed Control of Physical Body in aMartial Art,” JSME annual meeting 2007, No.7, pp. 29-30, 2007 (in Japanese). Y. Kohno (Supervision), “Surprizing evolution of physical body by Yoshinori Kohno,” pp. 58-61, Gakushu-kenkyusha, 2006 (in Japanese). Y. Kawazoe, S. Moriyama, J. Taguchi, J. Kebukawa, and Y. Ikura, “Development of ZIZAI Movement of Humanoid Biped Robot GENBE in a Martial Art (Going Up and Down the Stairs and High-Speed NANBA Run),” Symposium on Sports Engineering: Symposium on Human Dynamics 2007, pp. 391-396, 2007 (in Japanese). Y. Kawazoe, Y. Ikura, Y. Takeda, and M. Nakagawa, “NANBA TENNIS with Powerful and Injury-free Robust Movement Utilizing Equilibrium Instability without Kick of Ground,” symposium on sports engineering: symposium on human dynamics 2009, pp. 136-141, 2009 (in Japanese). Y. Kawazoe, “Reappearance from NANBA Walk to NANBA Run of Humanoid Biped Robot GENBE,” Japanese J. of Biomechanics in Sports & Exercise, Japanese Society of Biomechanics, Vol.12, No.1, pp. 23-33, 2008 (in Japanese). K. Rosewall and E. Kawatei, “Good Tennis,” Kodansha, pp. 65-68, 1975 (in Japanese). R. Oldenburger, “Automatic Control,” Vol.3, No.2, p. 69, 1956 (in Japanese). Y. Takahashi, “Automatic Control Engineering,” Iwanami Shoten Publishing, pp. 139-140, 1965 (in Japanese). Y. Kawazoe, Y. Ikura, Y. Koshimizu, S. Sujino, and M. Hara, “Mechanism of Robustness of Humanoid Biped Robot GENBE who Runs on the Ice and Snow Based on the Distributed Control of Physical Body in a Martial Art,” JSME annual meeting 2008, No.5, pp. 165-166, 2008 (in Japanese). Y. Kawazoe and Y. Ikura, “Mechanism of Robustness of Humanoid Biped Robot GENBE with NANBA-Walking and NANBARunning Based on the Distributed Control of Physical Body,” Symposium on sports engineering: symposium on human dynamics 2008, pp. 165-170, 2008 (in Japanese). Y. Kawazoe, M. Mitsuoka, and S. Masada, “Practical Education Curriculum for Autonomous Mobile Robot: Project Learning Program in a Class Based on Subsumption Architecture,” J. of Robotics and Mechatronics, Vol.23, No.5, pp. 684-700, 2011. Y. Kawazoe, K. Harada, T. Sunaga, T. Momoi, and Y. Shimizu, “Case Study of Human-Robotics : Autonomous Mobile Robots and Humanoid Biped Robots,” JSME annual meeting 2006, No.5, pp. 31-32, 2006 (in Japanese). T. Tachibana, “RSJ 20th Anniversary: Special Lecture 1: Robotics and Society in 21st Century,” J. of Robotics Society of Japan, Vol.21, No.3, pp. 222-231, 2006 (in Japanese). Y. Kawazoe, “Consideration ofMartial Arts – The origin of the martial arts watched from a robot –,” Monthly Magazine the “BUDOU,” Vol.534, pp. 34-37, May 2011 (in Japanese).